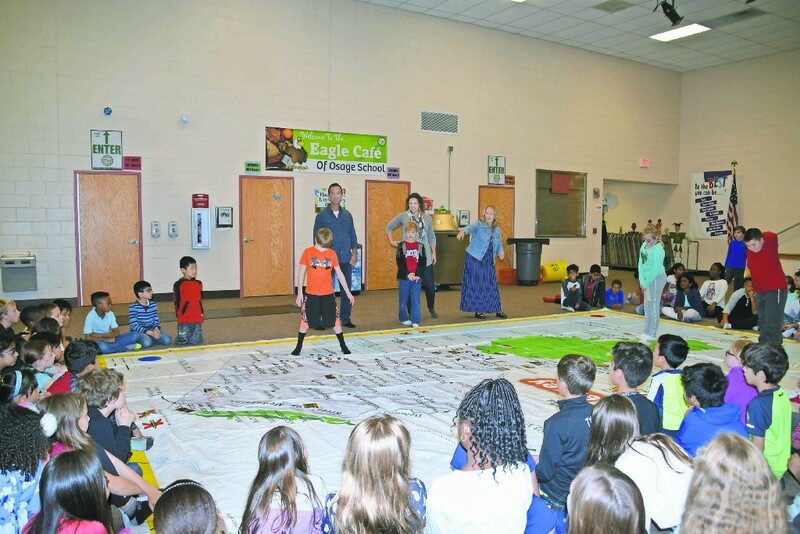 One of National Geographic’s “Giant Traveling Maps” entertained and educated fourth graders at Osage. New Jersey Geographic Alliance members Richard Federman and Teresa Brown of Rowan University, along with fourth grade Osage Teacher Colleen Rossi, presented one of two Giant Maps of New Jersey — a nationwide initiative overseen by National Geographic. The 16-foot x 22-foot mat is the largest map of New Jersey in the world. On Nov. 7, 125 fourth graders at Osage Elementary School rallied around a colossal map adorned with seashells, cranberry seeds and photos of Bruce Springsteen. The 16-foot by 20-foot vinyl map featuring Garden State staples is the largest map of New Jersey in the world, according to the New Jersey Geographic Alliance. New Jersey’s “Giant Traveling Map” is one of two produced by National Geographic, as every state owns a pair in this nationwide initiative overseen by the magazine. The recreational and educational power tool is a free resource requested by teachers for students in grade K to 12. For the first time, the map made its way to Voorhees, as New Jersey Geographic Alliance members Richard Federman and Teresa Brown of Rowan University led students through an afternoon cartography activities. National Geographic encompasses an alliance in every state, and New Jersey’s coordinator, Katrinka Somdahl-Sands, is based at Rowan. “We want the students to realize that geography is more than just memorizing capitals and names of rivers,” said Federman, a professor in Rowan’s department of geography, planning and sustainability. “Our students at Rowan — we get that message across to them, but we would like to get that message across to (the fourth graders.) So, by the time they get to us, they’re already ahead of the game … It’s hands-on and feet-on,” Federman said. The children were given five brown paper bags stuffed with pine cones to playing cards. After a few minutes of brainstorming in groups, they returned to the map and scattered the objects in their appropriate regions. From High Point State Park to the Belleplain State Forest, children could grasp the scope of New Jersey’s terrain. With photos of the boardwalk in hand, students were asked to stroll along the “coast.” Using one fourth grader’s foot as a “six-mile” ruler, the students configured the entire width of New Jersey to be about 72 miles. Geography is part of the fourth-grade curriculum. “For me, this map, being interactive and hands-on — it’s tactile and it’s visual. It gets them up out of their seats,” fourth-grade teacher Colleen Rossi said. This was one in a series of geographic educational events the alliance hosts through workshops, online resources, state geography bees and Geography Awareness Week, which was set for this week at Rowan in Glassboro.